Strange things come with the storm, things that can change one's life forever. On just such a dark night, a mysterious voiceless girl arrives at the doorstep of the powerful Duke of Rutland, Neil Arnold. Thanks to her, his gloomy soul will see it's first sunny days after a very long time. The Duke, while still trying to find his way back to happiness, will have to find the strength to protect not only the mysterious stranger that stole his heart but also his innocent daughter. He can't afford to lose the ones he loves for the second time. But the danger is resting closer than he thinks as no one can be trusted. Mary-Anne ran for her life. The ground underfoot was pure mud, slipping and splashing every which way beneath the torrential thunderstorm that raged through the Southern English countryside. She was gasping for breath, glancing frantically backward into the darkness, watching for the floating bulb of light that bounced along with each of his heavy steps. There! Mary-Anne was running again, tearing through the low grasses and shrubs, not caring about the brambles and twigs that caught and tore at her clothes and skin. She pushed on as the rain poured down, accompanied by glorious blasts of lightning and thunder. The light was growing more distant as she dashed on, gasping out for air but not daring to stop, not until she was clear. On and on she went, not stopping at even the greatest of stumbles, feeling her chest burning fiercely with the need for oxygen. There was a voice, deep inside, that saying It’s alright, you’ve made it. Sit down. Rest. She relentlessly ignored it, forging forward, feeling that slick, cold numbness overwhelming her skin. Then there was another voice, louder than the first, keep going, it said. You’re almost there. Mary-Anne did not know where she was, only that she had escaped the carriage on the road from London, sometime after they had passed through Camden. She had no idea how far she had run, and she knew to only keep running, as an all-encompassing, blind need to survive drove her in and out of creek beds, under farm fences, and finally to rest beneath a low bridge. She shuddered in her wet clothes, hugging her arms to her knees and bouncing her legs to keep warm. She could feel no heat within her; it was as if all of her body had been chilled, and now past the point of even warming itself. Huddled there, feeling the chill of the night set in around her and hearing the rage of the storm above her, Mary-Anne thought that she would die; that at any moment she would just cease to function, and collapse into the low river, to be found by some unlucky person come to wash their clothes. She felt sorry for that person and did not want them to see her like this, and then she remembered: You are not dying beneath this bridge. Mary-Anne struggled up, realizing only then that she had lost her shoes to one of the bogs she had traversed and found that she had no feeling in any of her toes. It was too late to be concerned about it, she had only to keep moving until she reached somewhere safe. Where was that? She had no clue of her surroundings, but as she climbed up to the road above her, she saw the lights of a manor house atop a high hill, looming out in the distance as either a beacon or a lure, and she knew not which. Another bolt of lightning cut out over the black rain, and she knew she had to seek shelter there. She began to hurry up the long, winding road, and each step was heavier than the last. Now, at last with a destination in sight, she could not find the strength to pull herself up the gravel road and found herself falling. She could not help it; she had finally used up all there was to give from her wells of resilience, and she struck the ground with an unceremonious splash. As she lay there, feeling the rain hammer down on her forehead, she saw the bobbing light of an oil lamp making its way down from the house, swinging with each sopping step of its carrier. She opened her mouth to scream out, NO! But no sound came from her terrorized vocal cords; instead, she flailed helplessly, utterly exhausted, defeated, and despaired at the arrival of the lantern. The lightning lit up the sky in terrific arcs, blasting the empty rooms with hollow light. The Duke of Rutland liked to watch the thunderstorms, drinking in the bright streaks of light and then waiting, ever so patiently, for the booming rattle of thunder to shake the walls of his fine house. The Duke was a grim man, slowly swirling his brandy about in his palm, letting the aroma waft upward and over him. He was good looking, as far as anyone was concerned — a strong brow and jaw that seemed to complement each other splendidly sat beneath his dark brown hair, which he let flop about his head aimlessly. Lightning flashed again, and he jumped back a bit at its sudden appearance. After it had faded and the thunder rumbled on, he smiled at his own nerves. Again, he jumped as a door banged open behind him. “Papa, Papa, I’m scared!” his daughter shouted, running into the room in her nightdress, her bare feet slapping against the oak-paneled floor. “Papa!” she hurried and hugged herself to his legs, watching with terrified fascination at the slices being made of the sky. “I’m sorry, Your Grace, she—” one of the nursemaids had come in, having chased Kaitlin down the hallways from her room, and was panting from the effort. The Duke held up his hand for silence and nodded to the sleeping child drooling upon his shoulder. The maid smiled at the caring father, who, despite his other social failings of late, always placed his daughter first, and with great compassion. The Duke of Rutland paced slowly through his elegant home, singing softly in his daughter’s ears the songs from his time as a soldier, as he knew no lullabies. Her mother had sung the proper ones. “Is that you, Neil?” An old lady’s voice came from one of the living rooms ahead, and he saw that she was sat by a small fire with a low oil lamp beside her. “What are you doing up, Grandmother?” Neil asked quietly, still gently rocking Kaitlin from side to side. “She was scared of the storm,” he parried and slowly sat down beside his grandmother. “She is a child, let her be one,” he said, sitting back in the armchair. Phyllis let out a long sigh, turning her head to look at the fire, flickering in the low brick hearth. After a moment of silence, another thunderclap shook the premises, and Kaitlin jumped awake, wide-eyed and startled. “Grandmother!” she said, leaping from her father’s lap and running to Phyllis, whose face was already rapidly changing to a broad smile, for not a soul in the house of Rutland could say no to little Kaitlin Arnold. “Hello, my child,” she said warmly, letting Kaitlin climb up onto the large armchair that she occupied. “Were you scared of the storm, too?” she asked innocently, hugging her grandmother’s legs. “Good night!” Kaitlin yawned, smiling adorably, and Phyllis’ eyes twinkled to see her great-granddaughter behave in any manner at all. Neil carried her off to her room and laid her down in her bed. As he drew up a blanket over her, she shifted in her sleep and curled into it, sleeping soundly. The Duke tucked in his daughter and left her room, feeling that rare sliver of happiness that haunted him through his hallways. It was a warmth, a glow, an exuberance for the world and for life, brimming from silver chalices, and he yearned for it. There it was, just for a moment as he cared for his daughter, but then again, he was alone in the wood-paneled hallway with the lighting cast strange shadows; the thunder rumbled on, and the happiness swiftly disappeared from view. Once again immersed in his morosity, the Duke dragged his feet down the hallway as he made his way back to his glass of brandy, all the way down in the second living room on the first floor. He had found his beverage and his chair, and resumed watching the brilliant flashes of light through the sky. He had just settled into a state of complete comfort when he heard the faintest sound of shouting. He perked up his ears, and indeed, it was shouting. He sat up, interested. What was the commotion? Rain was coming down in terrible sheets, slapping against the ground and turning dirt to swelling puddles of mud. He could hear Mr. Marton, the chief groundskeeper, calling out to some of the stable hands. Perhaps one of the horses had bucked from the carriage house in fright of the storm? Neil was becoming very intrigued and swished down the remnants of his brandy before rising to investigate. As he went through the living room and into the parlor, he encountered his valet, Thomas Penn, who had the look of a hurriedly-dressed, rain-soaked, very flustered man at that present moment, but otherwise was a gentleman in every describable aspect. “A woman?” Neil blinked, astonished. “What sort of woman? Out in all this?” He waved his hands at the thundering rain that constantly rattled on in the back of their ears. Their conversation was broken by the clatter of Mr. Marton and his two-horse team, coming into the driveway. Thomas gathered up the towels he had brought and opened the door for Neil, who stepped out onto his front steps that sloped grandly downwards to the tightly-bricked drive. The chariot rolled to a halt while Mr. Marton, the jolly round-faced groundsman, reined in the horses, and eventually climbed down from the driver’s seat. “Evening, Your Grace,” he called to the Duke, holding his lantern high above his head. “I am sorry to bother you so late.” Mr. Marton began to climb up and untie the straps holding the carriage door shut against the storm. “No, Grandmother, it’s nothing,” he shouted. “Oh, where is it,” Phyllis fretted, then halted, seeming to remember that something was happening. “Tell me, Neil, what are you doing? I’m not daft,” she called back and came out of the parlor with her abigail, a girl named Ruth. “Thomas, tell me what is happening.” Neil looked to his valet and gave him a shrug as if to say, I tried. “What has become of you,” Phyllis scolded. “A gentleman indeed.” She hurried down the steps to meet Mr. Marton at the carriage as he swung the door open. Neil felt his face get hot and his palms twitched as she took charge of the situation, helping the woman as she stumbled from the cab. She was thoroughly soaked — rain had found its way into every fiber of her clothing and hair, and both clung to her every movement, dragging across the carriage. She was dressed as a commoner would be, in simple garments beneath a heavy traveling shawl, and her face was shockingly pale from the cold of the rain. Yet even in her distressed state, there was a certain beauty about her features. The woman seemed faint as Phyllis’ abigail led her into the house, taking the entire stack of towels from Thomas as they passed. As Phyllis went to follow, Neil caught her attention. “What have you done? We know nothing of this woman and you have brought her into our house! What of Kaitlin? It is bad enough we must have so many servants about, and now this stranger? I will not have it!” Neil was becoming angrier by the moment, as he often did, and felt himself clutching at his own palms in a nervous tick. “We shall see,” Phyllis said defiantly and went off to find where Ruth had taken the mysterious woman. Neil was fuming and angrily dismissed Mr. Marton for the evening. He went back into his favorite living room, that overlooked the south hill of his estate and tried to calm himself by watching further strikes of lightning. However, he found himself quickly dissatisfied with the view and partook of some brandy that he had in the room. He paced back and forth, grouching to himself, poking his toes at the corner of the rug and then folding it back over obsessively. He hated it when his grandmother took action over him, but what could he do? It was so rare that she found the sense of presence to boss anybody around; evidently, the arrival of this stranger had awoke something within her. Neil also hated not knowing what was going on; it wracked at him incessantly. “Can I get you anything, Your Grace?” Thomas asked tentatively from the doorway. “I do not know, Your Grace,” Thomas said, pouring him another brandy in hopes it would settle his nerves. “Of course, Your Grace,” Thomas poured another brandy. “No, Your Grace,” Thomas said. “I shall endeavor to discover it,” he said, hurrying to the exit. “Come to gloat, have you?” Neil asked his grandmother. “Alright, so when she wakes up, she must be gone,” Neil said. “They do,” he said suspiciously, hearing the angle of her plot before it was delivered. The Duke knew he was beaten. His grandmother knew that if she pressed him, his defenses would fold like conscripts beneath French cavalry sabers. He worried about her, and the older she became, the sourer and more lost her overall attitude. The only things that seemed to ease it was time with Kaitlin and listening to the piano. Now it seemed she had found another; the care and well-being of this woman from the rain. “Of course,” she said, smiling wide, then something went out of her head, as it always did eventually, and she looked to Neil, puzzling. “Have you found my hand mirror?” she asked, somberly. “No, Grandmother, but Thomas is looking for it.” Neil’s heart fell through his chest at her lapse. “Now I must be to bed, for as you have kindly reminded me, I must travel to London on the morrow. Goodnight, dear Grandmother,” he said dramatically and fumbled his way off to question Ruth about Phyllis, then to bed. As he lay there, in his feather bed made up with silk sheets, gazing up the intricate woodwork that adorned the bedposts, his mind would not slumber. Each time he closed his eyes he saw the woman falling from the carriage, and her pale, freezing frame seemed stuck in his mind’s eye. While he slowly drifted off to sleep, he asked the same question again and again. Who was she? And where had she come from? The mystery of it all consumed his thoughts as he dozed off, and still, her face lingered in his mind’s eye. Julian Bastable was an enormous man. When he was standing, which was not altogether that often, he boasted an impressive six-feet tall, which was a great deal taller than most people he ever came into contact with. Besides his height, which was notable, his waist slumped out over his breeches and was cleverly contained by elegant sashes that he had acquired from a contact he had in India. The forty-six-year-old rather liked the colourful, comfortable bolts of cloth, and thought that they were far more successful at disguising his obesity than they were in all actuality. On that particular Wednesday, Julian sat at his wide desk specifically constructed from Amazonian timber. He ran his thick, calloused fingers over stacks of banknotes and leather-bound notebooks that were full of scribbled annotations. Every once in a while, he flicked a guinea between his knuckles because he liked the way it felt and it took away from the monotony of counting and then recounting. The sun rose with a particular brilliance that occurs only on days after a terrible thunderstorm. The bright day came through the foggy glass windows of his London counting house, and he grumbled at the noise welling up outside by the street goers and their hollering, by the carriages and the clomping of horses’ hooves on cobblestone, and by the bells ringing out from Old Bailey and St. Martins. Julian stood slowly from his desk, shifting the whole piece of furniture with his body weight and it groaned across the oak floors. He sauntered then, ever so slowly, to his second-story window, and looked down on the bustling street below. He flicked open the intricate, gold pocket watch that he carried, and noted the time with a click of his tongue. “Quarter past ten,” he growled. If there was one thing Julian hated, it was waiting on a business meeting. He believed that business, like all things, only functioned properly when all parties played their respective parts and played them as was proper. “Randolph!” he barked. He flicked a subtle amount of spittle against the window. “Yes, sir?” a nervous-faced young man of fourteen scurried up the stairs. He was dressed as a clerk would be, but was a sight dirtier than one would expect, due to the fact that he did the duties of both clerk and custodian in the counting house - as Julian had let go the custodian some months ago for personal reasons. So, bounding up the stairs that morning, Randolph carried with him a flagon of whale oil to ensure all lamps were lit. “What the devil are you doing?” Julian blinked at Randolph, who squirmed nervously in his boots. “Lighting the lamps, sir?” Randolph asked, knowing that at this point, anything he said could and would be turned against him. “Yes sir, of course, sir,” Randolph began to shy away, red faced, hating his employer but needing the job too badly to walk away. “Very well, off then,” Julian shook his head. His morning engagement was running late, and he was worried about a possible scheduling conflict with the Duke. The Duke was a massively important client, and Julian would spare no expense to finalize their agreement. Finally, the wool merchant arrived with the notary, and after some brief pleasantries over tea, and a laughing splash of brandy, they signed a series of documents and bank notes. They all shook hands, stamped the pages, and Julian became a good deal richer than he was before. Afterwards, he relaxed with a heavy lunch, including a good deal of wine, and gleefully boasted to Randolph about the day’s success before noon, then had him clean it all up before the Duke arrived, which he did precisely at one o’clock. The doorbell jingled as the Duke pushed in the door, accompanied by Thomas. “Mr. Bastable,” he called out. “Your Grace,” Julian called down. “Please come on up. Randolph, get their coats.” The servant did so, and the two advanced up the stairs, taking in the sights of sturdy boxes, filing cabinets, and crates of various wool samples. “Mr. Bastable, so nice to finally meet you,” the Duke said, shaking his hand. Randolph and Thomas stood by silently, patiently waiting to be called on for any sort of service. “Thank you.” The Duke carefully inspected each of the documents. “As discussed by letter, I shall take these to my solicitor and return to you with any edits he may desire.” He handed the papers to Thomas who neatly slid them into a carrying case. “Of course,” Julian said, rising from the desk. “And I shall eagerly await your answer.” Shaking his hand, the Duke said, “Mr. Bastable”. “Your Grace,” Julian returned the farewell and watched them leave with a broad smile. After they had gone, Julian clapped his grubby hands together as his cheeks burst out brightly, bulging into tomatoes between his mustache and meticulously-groomed sideburns. “Dash what I said, man!” Julian was exuberant, shifting his feet back and forth, tapping his knee, rubbing his palms together, and cycling through a number of preset grins. “Fetch it, for today we have just cause to break our own laws, come now,” Julian said, waving his hands at Randolph, who scurried over to one of the locked cabinets. Randolph sorted through an arrangement of keys around a small brass ring that was in turn, fastened to the inside of his waistcoat by means of a small iron chain and lock. The key to that lock sat comfortably in one of Julian’s side pockets. From the cabinet Randolph retrieved a decanter most extravagant; it was finely-etched crystal with rings of emeralds around the crest, and within it was the most expensive scotch Julian had ever stumbled across. It was a testament to Julian’s climb into a high class of living, and he drank from it only when he felt he had moved another step. “Of course, sir,” Randolph said, pouring a glass for his employer. Randolph moved to pour himself a glass as well, as it seemed second nature. “I’m sorry, sir,” Randolph said, his face blushing. “I did not mean to offend you, I was not thinking properly,” he stammered. “Of course, sir,” Randolph said. He had grown used to Julian’s occasional ramblings about class and social status, which seemed always to be aimed at him, at least slightly. “It is nothing personal, of course,” Julian said, examining the brandy closely with his nose and eyes, savoring the stinging fumes. “What can one do? We are born a product of our evolutionary tracks, and if one’s lot is that of inferior intelligence and a lack of overall ambition, such as yourself, then one shall be condemned to their pre-destined station for the entirety of their miserable, wretched lives,” Julian snarled out his words, and then took back the brandy in a single swig, afterwards letting out a pleased exhale. “A mighty fine treat,” he said, licking his lips for any spare bead of moisture. Then his mood suddenly swung while his mind wandered, dancing back several nights to a tussle in the trees, and he cursed the brutal, indiscriminate cruelty of the world. When Mary-Anne opened her eyes, she thought for a brief moment that she was still dreaming. The bed she lay in was more comfortable than she had ever experienced. The sheets were white as were the walls, and the sunshine came through the wide, white shuddered window above her with a blazing dominance. It was the warmth of the sun that woke her, for it seemed such a stark contrast to the last thing she could remember; the cold and wet of the thunderstorm flooded back for a moment, causing her to jump, but she settled in the dry, comfortable sheets. Forcing herself upright against a pile of pillows, she felt the prick of the end of a feather poking through the fabric and knew that she was still alive. What happened? Mary-Anne thought, drawing her knees close to her chest. I thought that he had found me, I thought that I was dead, she coupled with these thoughts, fixating on the image of the lantern, bobbing towards her through the rain. He surely would have killed me. The door opened as Ruth entered, holding in her arms a pile of folded sheets and towels, and almost began turning the room over before noticing that Mary-Anne was awake, sitting up on the bed. “Bless you,” Ruth exclaimed, rushing to her bedside, and taking one of Mary-Anne’s hands. “You’re awake, poor girl, what happened to you? Wait, never mind me, Her Grace must be alerted at once, for she has taken such an interest in you,” and before Mary-Anne could attempt a reply, Ruth was gone from the room. If it was not him who found me, then who? Where am I? Mary-Anne thought, peering out of the window. Below she could see extensive grounds, reaching out over shallow wooded hills, spiraling down from the hill-top manor house. Out on the edges of view, she could make out a series of cottages clustered together in small hamlets along a river. I am on an estate, Mary-Anne realized. The maid had said “Her Grace,” she thought. Just how lost had she gotten, running through those woods? “Kaitlin, leave the poor woman be,” Betsey, Kaitlin’s primary nursemaid and governess, came hurrying after the curious, energetic child. “Is she an angel?” Kaitlin looked up to Betsey, resting her hands on the top of the chair and sitting on her knees. “I want to talk to the angel,” Kaitlin protested, but she was escorted down the hall. Mary-Anne could hear them moving further and further away, then the creaking of stairs. How long was the hallway? How grand was this house? Mary-Anne thought and was swinging her legs out from the sheets when Ruth came in again, followed closely by an elderly, teetering woman. She had a complex, wrinkled face, yet there was a kindness behind her furrowed eyes. “Oh!” Phyllis called out, happiness pouring from her face. “You are awake, thank you, Lord,” she crossed herself. “Come, you must tell us everything, are you hungry? Where are you from?” Phyllis sat on the edge of the bed, reaching out for Mary-Anne’s hands, but she withdrew them, shrinking into a small ball, away from the boisterous, old lady. Phyllis seemed heartbroken by Mary-Anne’s hesitation and began to feel her mood souring, quickly as it always did. Your Grace, Mary-Anne thought. So, this old lady was nobility. But she was so old, she had to be somebody’s mother or even Grandmother? “More rest,” Phyllis sighed, looking deeply into Mary-Anne’s eyes. There was a darkness there, some sort of unyielding fear. “Yes, yes, perhaps Ruth, perhaps more rest,” she began to mumble, feeling her concentration fading away to the edges of her consciousness. “Ah, Mr. Eddington,” Phyllis said, smiling. “Now there is a proper gentleman of good stock and quality. However, perhaps he holds too much respect for French violins,” Phyllis continued to ramble as Ruth steered her to one of the sitting rooms and gave Mary-Anne a patient smile. She is not all herself, Mary-Anne thought. How sad it could become. Mary-Anne was thoroughly confused. The last thing she could remember was collapsing in the road, and now she found herself in the shelter of a manor house, taken in by mentally-unstable nobility. Mary-Anne sat blinking at Ruth. “The Duke of Rutland,” said Ruth. “Your host is the Duke of Rutland, and His Grace has gone to London on business,” Ruth said, laying down a set of clean clothes. The Duke of Rutland? Mary-Anne thought. How did I come to be here? Mary-Anne had not said anything in reply. She sat there, a crumpled ball of nerves, not wanting to move. What is wrong with me? She wondered, rocking back and forth. All she could see was that lone lantern, coming straight towards her, and that indomitable fear that took root deep within. After several minutes of sweating and rocking, she regained some of her composure, pushing her long hair back and breathing deeply, looking out at the beautiful English countryside. The manor home really did impose a magnificent view from what she assumed was the third floor, based on the height of her window. It is alright, she thought. You are alright. Somehow, someway, you are alive and well. Mary-Anne rose, and tentatively dressed herself in the fresh clothing. She opened her mouth to call for Ruth, but to her astonishment, she found she could not speak. 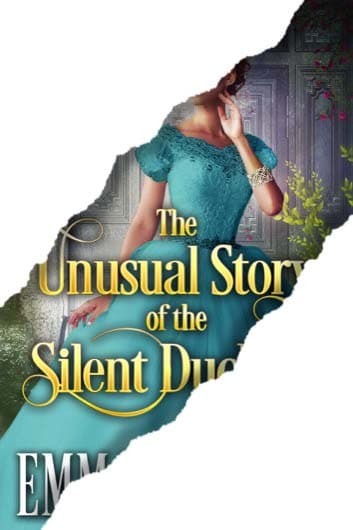 The Unusual Story of the Silent Duchess is live on Amazon now! I’m intrigued by what I read so far. I can’t wait to read the rest of the story. Switch u a turkey leg. (Only one bite missing) for rest of story…..please….please…. please!!!! What an interesting premise!! I am immediately drawn in to all the characters. I can’t wait to see how it turns out! s. I am sure the whole story will be riveting. Mystery at the start. I like that. Hint of romance in the air. Very good beginning! I’m impressed and hoping to get.the.rest of the book.. Very interesting story, the few chapters I read,catch ones interest, and I could not wait to read the rest of the novel. Sounds a good story line! Looking forward to whole story. Sounds very intriguing. Looking forward to the rest of the tale. I. Like this so far. What a great beginning to a story! It sounds like another winner for this talented author. Looking forward ‘to the rest of the story’. This sound like the beginning of a very good read. I would love to find out how she becomes a duchess. Interesting story with lots of potential for character growth and interaction! I’m looking forward to this book, it sounds very interesting! be just as good as the others. Shuttered windows not shuddered windows. It has my interest! Who is she and what is she escaping? Loved it! I want to know: WHY was Mary-Anne coming from London, and with whom so that she had to escape? What will happen between Mary-Anne and the little Kaitlin? Who is this beastly and dastardly Mr. Bastable (a modern day Scrooge) and does he have anything to do with Mary-Anne’s running away? I would love to read the rest of the story! I am wondering if Julian has something to do with the state Mary-Anne is in. Should be interesting in finding out what really did happen on the road. You have my attention. Loved the prologue; excellent story to get the reader hooked! In just a couple of chapters there are already many interesting, and connected plots going on. Very nicely done. November 29 can’t come soon enough! Another very enjoyable start to one of Emma’s books, looks if it will be a very interesting and intriguing romance. Cannot wait to read the whole book, there should be some interesting reviews. And that doesn’t even cover what I feel after reading this ! What an suspense filled start to a book! Can’t wait till it releases , and I’m thinking it’s going to do well! An intriguing tale so far and one with sufficient Hook to lure in Readers! I think you’re going to love this story, honey…❤️ Thank you so much! This preview definitely has me interested! I now have many questions: who is Mary-Anne? What, or whom, is she running from? What has happened in the Duke’s house to make him rather sour but very protective of his daughter? What happened to Grandmother–is it age or events that have de-stabilized her? What effect will last night have on all of these people? Can’t wait to read more! Very intriguing!!! Cannot wait for the book to be released. Wow. What a good read! It was so well written and gave so much insight into not only the nobility but the common people of the time. It describes their desires and feelings of their thoughts and desires—good and bad. Don’t want to tell the story but did so appreciate that honesty is s vertue. This is a great preview. I think I figured out how MaryAnne lost her voice, but I really wany to know how she gets it back. The Duke, now his story I really want to know. What happened to him to make him unable to be happy. I will definitely be getting this book when it comes out. The amazing start of a masterpiece!! Well written makes it hard to wait for the rest of the story. I loved the preview!! I can hardly wait for Friday😁 I am already invested with the characters. The only thing I could say to change is you described the lightening, when she was fleeing, as glorious. Since it was her thoughts, I assume, I would think she would have seen it as ominous or threatening. I know what I will be doing this Friday!! And thanks for the suggestion!! Sounds like a good read, interesting , different, possibly very romantic . Very intriguing! Love the characters so far. I want to read more!! It caught my attention. Can hardly wait 2 more days. Loved the preview! I can not wait to read the rest. I really like the introduction of the characters and got a good feeling of who they were.